Meet them or bring them? I’ve been told ever since dental school that if I just use the right words I can get any patient to accept any treatment. At the very core of this narrative is that patients can afford the treatment that we propose, but they choose not to. They’d prefer to buy cell phones, new cars and cable. But if we’re good enough (and if we take their course) we can motivate them to forgo these luxuries for the glories of comprehensive dental care. It never seems to occur to those folks that the value that we put on complete dental health is a value judgement that patient may not share. I’ll go even further and say that it’s O.K. if patients don’t value their teeth. Because I’d much rather work on a patient that already values having healthy teeth and gums than one I’ve convinced that they should value it. Perhaps the one I’ve talked into receiving my valued service is the one who’s more likely to have buyers remorse. I have a friend that is really good at case presentation. He takes lots of photos, fully mounted study models and CT scans. Often he’ll have the photos digitally enhanced to let the patient know what his proposed treatment might look like. He does big cases. Lots of them. The kind of cases that much of dental continuing education explains that we should be aspiring to. He’s a very skilled and conscientious dentist. Recently, he was sanctioned by his state board for supposed record keeping violations. How do you think the board found these “egregious” errors? Was the patient unhappy with the quality of the dentistry done? No. In fact, the patient had no complaints about the dentistry. It was just that she felt like she had paid enough for the work that was done and was “confused” about how much the treatment was going to cost. I’m positive that my friend had the patient’s best interests at heart. He knows how to deliver some amazing care. I think he persuaded her why she should value the kind of care he wanted to deliver to her without her actually valuing the care. Our patients value all kinds of different things. It’s not our place to judge them for it. This is really hard for most dentists and dental team members. Everyone has heard a patient explain that they don’t want to spend the money on this tooth and soon after they talk about their upcoming trip to Mexico. This drives dentists crazy. “If they only valued their teeth the way they value their vacation” we think. We judge their priorities and what they value. It’s obvious to us that they should prefer more optimal dental treatment over a stupid trip to Mexico. I have to admit that I’m guilty as charged. Can we possibly admit that valuing a long anticipated vacation to Mexico over placing that implant is O.K.? Perhaps one person’s “optimal dental health” is quite a bit different than what we dentists think of as optimal and that’s alright. We need to educate patients about their condition separately from whatever treatment plan we might be proposing. That’s part of being a doctor. And part of getting true informed consent. The patient has autonomy and always should. Your superior skills of persuasion aside, the patient has a right to their own messed up teeth if that’s what they prefer. I don’t want to come off like I’m not in favor of the concept of “comprehensive dentistry.” But I don’t think that paradigm is a good fit for everyone. In fact it’s probably not a great fit for a majority of people that might walk in your door. Some folks need a full mouth rehab but will only choose to have the painful tooth removed. As a dentist you need to know a lot of things, but one very important skill is being able to meet the patient where they are. 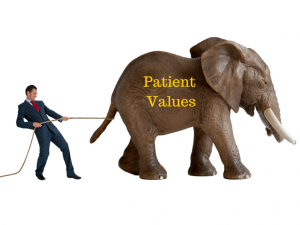 After all, patient values can change over time and being the one that helped them when they weren’t interested in much treatment can help you be the dentist they find when they are interested in more and potentially better treatment. Letting people know what you’re seeing and explaining what you can do for them is our duty. Persuading people that the way they value dental care is wrong is a recipe for disaster and short circuits the patient’s autonomy. Very well said. I’ve always said that sometimes patients have to break or lose a tooth before they are ready. Patient readiness is what we wait for. For when they are ready, they own their problems. The part where you educate patients about their health without proposing plans is “golden” and the concept of just making treatment plans without them understanding what is happening in their own mouths is a big problem. Keep up the good work. You said what I was trying to say in a lot less words. Not the first time that’s happened! Yep. Summed up (by me): You can’t care more than the patient cares. And, the sooner you figure that out, the more of your own sanity you’ll retain. Wow, great article. I’m really impressed with how well this is written, and the information therein! I’m a “blogging dentist” in SLC, Utah and I definitely understand the frustration. I agree with Bilal; education without proposal seems to be the most effective method for our office. Thanks for this! Great job! We all get frustrated with our patients at one point or the other. These objections, though, don’t necessarily translate into rejections. Well, at least so far in my practice. Sometimes, patients just need time to consider the treatment plan we present to them. Worst case scenario – just be ready, have a positive attitude and move on lol. This is something that I find extremely important to convey to patients, especially in light of sorting out their “priorities”. Have you found any effective means to convey this information in way that they not only understand the concept, but importance so that they don’t feel “confused” by their treatment? I would like to swap ideas with you about this. It’s amazing how you can affect into people’s reactions and attitudes by words. And even more amazing how all of it can change in seconds if you do something that client thinks is wrong..
Hello Alan, You have well expressed the pain point of patients’ mentality. This is what stops them from being healthy by allowing right treatment for them. They must understand and value the advices for treatment as it will only benefit them. By saving some bunch of money they are risking their valuable property- their health. Well stated. As Paul Homoly and others remind us, “It’s about timing”. We should be “seed planters” of needed dental work but a lot of time must wait for the harvest to come later if we are a good keeper of the soil. Also, great point about respecting and supporting Patient Autonomy- one of the Principles of the ADA Code of Ethics. I think you’re right but I don’t think using persuasive tactics are wrong as well, I think it all comes down to how it’s implemented. Using things like the “rule of reciprocity” & neuromarketing tactics that outline pain & resolution can be a big help in eliminating buyers remorse. Showing graphic photos of the worst possible outcome will embed in a persons mind and the person will likely carry that image through out the day if not several day’s in fear as to what was seen in that picture, possibly happening them. Our minds have a tendency to gravitate to the worst possible scenario, we convince ourselves that “this might be me if I don’t do it”. But you are right, if a person cannot afford it, then just leave it be but if you know the person can afford to do the treatment but just chooses not to, the above tactics can be of help but at the end of the day, it’s their choice. When taking care of people’s teeth, it’s so important to find a balance between making them feel comfortable and also looking out for their dental health. They may not be comfortable with the proposed treatments or they may not have enough information. Listening to what they have to say is so important because it will help you assess their comfort level. A patient’s priorities are often as confused as they are mysterious. In the end, a dentist can only gently recommend treatments to avoid being perceived as a wallet-extractor. It comes down to image and trust. Very well said. Patients should be ready themselves rather than being persuaded by dentists to do something that they didn’t wanted to. Like you rightly pointed out, convincing someone of the right oral care shouldn’t come at the cost of buyers’ remorse. A dentist should be able to explain the situation and let the patient take a call. Thanks for sharing this great article. People mostly won’t make a right decision until it’s too late. Nice concept of meet them or bring them. It is very good to see how people follows it to prevent cavities. So true. There is no point in delivering treatment to someone who does not really want it. It’s interesting to see the consequences of this in your example. If you stay focused on delivering quality care, there are enough people out there who already want it. To some extent, lack of awareness results in patients not valuing the health of their teeth or gums. If people only knew how oral health can affect general health, they would not neglect dental issues. The example you’ve shared of your friend is not uncommon. And I totally agree with what you’ve written about educating patients about their condition before even approaching the subject of the treatment plan. Dental problems just do not seem urgent. You may feel totally healthy even if your mouth is teeming with bacteria. Education is the only route. And it does need a great deal of patience. Very well said. Most times, our patients overthink and that at times drives us to the edge. Salute, to this beautiful article. Thanks for sharing this nice article. Its helps to knowing about dental problem. Great post Alan. Thank you. My corny dental joke is that “even if you choose nothing we can still be friends.” (no one wants to be friends with their dentists). I really do not have an (emotional) investment in the patient’s choice, I just try to do the best job presenting the menu. Great valuable and important info thanks. I would imagine that to a patient, a hefty investment into one’s dental and oral health may not be a priority, and that jet ski may look pretty good. I guess many people do not understand the ramifications of ignoring dental problems in the present. I would say a practitioner should be understanding of each patient’s unique position. The best that the dentist can do is communicate their recommendations, the consequence of not addressing these dental issues. Like it or not, it’s important to have strong skills to convince patients about dental treatment. Sure, it’s more “fun” to have a new iPhone in the short-term, but what about long term health affects? This is a great article about the reality of patient mindset these days. Thank You! My repeated problem with dentistry is not that I am unwilling to pay for good care, it is that often options are presented as necessary when they are really not. For example I recently changed dentists because my dentist said he needed to remove all my amalgam fillings because they contain mercury. My new dentist wants to charge me an extra $600 over my insurance coverage (which covers a normal deep cleaning/scaling etc) for antibacterial injections and laser treatment for my periodontitis. How do I know this is reasonable? I don’t have this problem at all with my MD. Maybe the reason is the insurance system. 1) You don’t need antibacterial injections and laser treatment for gum disease. If you feel like your dentist is “selling you” on something you need to hold them accountable. Ask them questions until you feel like you’re getting the whole story. If you can’t get there…you need to find another dentist. 2) Your dental condition has literally nothing to do with your insurance coverage. Some people with great insurance need no dental interventions outside of a plain old “cleaning.” Some people with decent dental insurance coverage need way more work than their insurance will cover. Make your dentist explain themselves to you. Make them talk to you like a person and not an insurance policy or a potential dollar amount. Thank you very much for your reply Dr. Mead. After I wrote this I did some research that corroborated your opinion, including the ADA and AAP statements on laser therapy. When I returned to the dentist I asked for just the deep cleaning, with scaling and root planing. The dentist gave me a hard time about it, and they asked me to sign a disclaimer that stated that I might lose teeth, etc. because of my decision. They did the cleaning at least, and now the dentist has shifted to blaming my gum pockets on tightly spaced teeth and recommending invisalign and something called maxillofacial therapy. As far as I can tell the dentist diagnosed periodontistis based on very quick probed pocket depths and my xrays. My gums don’t bleed and I have a copy of my radiographs; comparing them to examples online it seems to me that my bone loss is mild at most and the spaces she pointed out to me as bone loss are normal or close to it. Unfortunately my insurance is only accepted by about 3 dentists in our area, and I have already gone through two of them. I guess I’ll keep trying to talk with this one, but I wish I did not need to be so skeptical.